The paper describing Heidi Mai-Lis Andersen's study is now available from the home page of Applied Animal Behaviour Science. The study was concerned about the use of an ear skin temperature sensor as indicator of well-being in slaughter pigs. The manuscript was submitted at the start of the year. Heidi M.-L. Andersen, Erik Jørgensen, L. Dybkjær, and Bente Jørgensen. The ear skin temperature as an indicator of pigs' thermal comfort. Applied Animal Behaviour Science , In Press, 2007. The aim of the study was to investigate the relationship between the ear skin temperature and the behaviour of pigs. 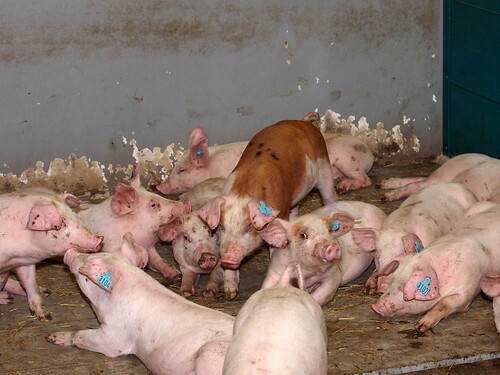 Fifty-four pigs weighing 75 ± 5 kg were used in three replications (18 pigs per replication) and housed in pens (six pigs per pen) in a controlled climate facility. The room temperature was changed by 2 °C from 18 °C down to 10 °C and up again to 22 °C. The ear skin temperature (EST) was continuously recorded and the activity, lying posture, location and contact with pen mates were scored by 12 min scan sampling for 24 h at the set point temperatures 18 °C, 10 °C and 22 °C. A diurnal rhythm in the EST, the posture and the lying behaviour was found. The EST was highest at night and lowest in the afternoon. During night the pigs had more physical contact to pen mates than during day time. For all three set point temperatures the predominant lying position during the night was the fully recumbent position. The room temperature affected the lying behaviour and the EST. With decreasing room temperature the pigs increased their contact to pen mates and fewer pigs were observed lying in the fully recumbent position. The EST decreased with decreasing room temperature, and the range in the EST's at the three set point temperatures was larger during day than night (4 °C versus 2 °C). The results indicate that pigs adjust their behaviour to a higher EST when resting than when they are active, and they use behavioural adjustment (e.g. increased/decreased contact to pen mates) to bring their skin temperature into a preferred interval. As mentioned in the previous post the article about rooting materials has been accepted. In addition, the accompanying methodological paper mentioned here has now been printed. The paper describing the results from the choice experiments with rooting materials described here as now been accepted for publication Applied Animal Behaviour Science, after one revision round. I expect that the paper will be available online within a couple of month, but actual publication will probably not occur before next year. A paper describing the effect of floor heating on behaviour and physiology during farrowing has been submitted to Physiology and Behavior. The paper was written as part of the project concerning loose housing systems for farrowing sows. My contribution was mainly concerned with the hormonal profiles during parturition. The results indicated that during parturition the profiles were better described using a relativ time-scale (proportion of farrowing time) rather than the chronological scale. It was also of interest that there seemed to be a treatment effect on variability between animals. As usual, the description of the statistical methodology had to be kept to a minimum, and I am a little anxious to see, how it is received. J Malmkvist, B.M. Damgaard, L.J. Pedersen, E. Jørgensen, K. Thodberg, H. Chaloupková, and R.M. Bruckmaier. Floor heating effects on HPA-axis hormones, oxytocin and behavioural activity in sows. 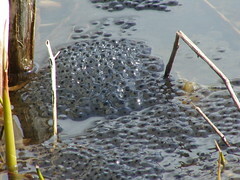 Physiology & Behaviour , submitted:1–21, 2007. A paper describing Heidi Mai-Lis Andersen's study about the use of an ear skin temperature sensor as indicator of well-being in slaughter pigs has been submitted to Applied Animal Behaviour Science. Heidi is employed in the research and development department at SKOV A/S, and the paper is part of her Ph.D. thesis. SKOV A/S is working in the field of climate control and production monitoring for animal agricultural production, and collaborates with several research institutes. During the final part of her Ph.D. study Heidi has been working in our research group. As a Ph.D. student she was affiliated with the Royal Veterinary and Agricultural University in Copenhagen. Or, since January 1, the Faculty of Life Sciences at the University of Copenhagen, Department of Large Animal Sciences, following the recent restructuring of the Danish research institutes. H. M.-L. Andersen, E. Jørgensen, B. Jørgensen, and L. Dybkjær. The ear skin temperature as an indicator of pigs' thermal comfort. Applied Animal Behaviour Science , submitted, 2007.